What Is Their Lasting Damage? The 9/11 attacks had both immediate and long-term economic impacts, some of which continue to this day. While it cost al-Qaeda an estimated $400,000 to $500,000 to plan and carry out the attacks on the World Trade Center and the Pentagon, a 2011 report from the The New York Times put the total costs to the U.S. at $3.3 trillion. The attacks caused the Dow to drop nearly 700 points and deepened the 2001 recession. It also led to the War on Terror, one of the most prominent causes of government spending in U.S. history. The breakdown below includes immediate costs and physical damages of the attack, as well as the economic impact, homeland security, war funding and future war costs. On the morning of September 11, 2001, 19 terrorists hijacked four planes. Two were hijacked from Boston's Logan airport, one took off from Newark Liberty International Airport in New Jersey, and the fourth originated at Washington Dulles International Airport in Virginia. The terrorists chose planes headed for the West Coast because they would be loaded with fuel. They planned to cripple the U.S. economy by destroying three centers of power: Wall Street, the Pentagon, and the White House. The first two planes hit their targets. American Airlines Flight 11 crashed into Tower One of the World Trade Center at 8:46 a.m. United Airlines Flight 175 crashed into Tower Two at 9:03 a.m. Millions of viewers saw Tower Two collapse live on television. Tower One collapsed from the top down at 10:28 a.m. Tower Seven at the complex was damaged from debris and later collapsed at 5:20 p.m.
American Airlines Flight 77 crashed into the Pentagon at 9:37 a.m. Portions of the building collapsed at 10:10 a.m.
United Airlines Flight 93 never made it to its target, the White House. At 9:23 a.m., after the World Trade Tower crash, dispatcher Ed Ballinger texted all flights he was following, including Flight 93. He said, "Beware any cockpit intrusion two a/c hit World Trade Center." Five minutes later, the terrorists killed the pilots and took control of the plane. By that time, at least 10 of the passengers had talked to loved ones via cell phone. They heard about the World Trade Tower attacks and figured out their likely fate. At 9:57, the brave passengers attacked the terrorists. Flight 93 crashed into a field in Shanksville, Pennsylvania at 10:03 a.m., killing all 40 passengers and crew members aboard, as well as the four hijackers. The Federal Aviation Administration shut down all New York City area airports at 9:17 a.m. President Bush announced the terrorist attack at 9:30 a.m. Ten minutes later, the FAA shut down all U.S. airports for the first time in history. The total death toll of 2,977 – not including the 19 hijackers – surpassed that of Pearl Harbor in December 1941. 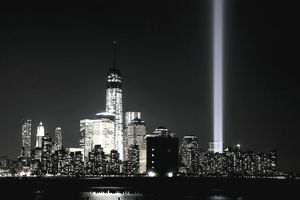 The death toll included 2,606 people at the World Trade Center, 125 at the Pentagon, and 246 on the four planes. A 2002 report from the New York Comptrollers Office estimated the cost of 9/11's physical damage at $55 billion. Of that, $24 billion is the expected income of the lives lost. The value of the World Trade buildings alone was $8 billion. Computers, furniture, and cars cost $6 billion. The damage to utilities and the subway system was also $6 billion. Damage to other buildings cost $5 billion. The city spent $5 billion to treat injuries, including those suffered by first responders who inhaled the toxic dust. It spent $1 billion to clean up the area. The stock market closed for four trading days after the attacks, the first time since the Great Depression, when President Roosevelt closed the exchanges for two days in March of 1933 to stop a bank run. The Federal Reserve dropped the fed funds rate half a point to 3.0 percent. The stock market reopened on September 17, 2001. The Dow promptly fell 7.13 percent, closing at 8,920.70. The 617.78-point loss was the Dow's worst one-day drop at that time. Stock prices recovered that loss by October. Oil prices fell from $23.77 a barrel in August 2001 to $15.95 in December. Although oil prices decline in the fall, this was a sharper decline than usual. Another cause was the dollar's value which rose sharply between August and December. Investors perceive the U.S. dollar as a safe investment during times of crisis. Send oil contracts are priced in dollars, oil exporters can lower oil prices when the dollar strengthens. The airline industry lost $5 billion from the attacks. The four-day shutdown cost $1.4 billion alone. Passengers were afraid of flying for at least a year. As a result, 1,000 planes were parked during that time, and thousands of workers were furloughed. On September 22, Bush signed into law $15 billion in federal loans. The 9/11 attacks worsened the 2001 recession, which had begun in March 2001. The economy had contracted 1.1 percent in the first quarter but bounced up 2.1 percent in the second quarter. The attacks made the economy contract 1.7 percent in the third quarter, extending the recession. Growth returned to 1.1 percent in the fourth quarter. The Y2K scare had initially caused the recession . It created a boom and subsequent bust in internet businesses. Although the recession ended in November 2001, the threats of war drove the Dow down for another year. It hit bottom on October 9, 2002, when it closed at 7,286.27. That was a 37.8 percent decline from its peak. No one knew for sure if the bull market had resumed until the Dow hit a higher low March 11, 2003, closing at 7,524.06. Unemployment continued to climb until June 2003, when it reached 6 percent. That was the peak for that recession. On September 20, 2001, President Bush called for a War on Terror. He said, “Americans should not expect one battle but a lengthy campaign, unlike any other we have ever seen.” Then he put it into action. Bush launched the War in Afghanistan to find and bring to justice Osama bin Laden. He was the head of the al-Qaeda organization that launched the 9/11 attacks. In its first year, Congress appropriated $29.3 billion in emergency funding for the war. On March 21, 2003, President Bush sent troops into Iraq. He said the Central Intelligence Agency had found weapons of mass destruction. He added that Iraq's leader, Saddam Hussein, was aiding al-Qaeda operatives. Congress appropriated $36.7 billion in emergency funding for the War in Iraq in its first year. The costs for both wars kept mounting. By the end of Bush's two terms in office, the War on Terror cost $1.164 trillion. That was added to increased spending for the Defense Department and Homeland Security. President Obama spent $807 billion during his two terms. President Trump budgeted $156 billion. That brought the cost of the War on Terror to $2.126 trillion. The most significant economic impact of the 9/11 attacks was how the increased defense spending led to the U.S. debt crisis. Without the War on Terror, the 2018 debt would be $19 trillion or less. That’s $21 trillion total debt, at present, minus $2 trillion. That would be 93 percent of the country’s economic output. The U.S. gross domestic product was $20.4 trillion in 2018. This total is still higher than the 77 percent debt-to-GDP tipping point recommended by the World Bank. But it's much better than the actual 104 percent level. The War on Terror reduced funds for stimulus programs to boost the country out of the 2008 financial crisis. Fewer jobs were created, which meant less tax revenue and a further increase in debt. That also meant less funding for infrastructure repair and replacement. High debt levels became a crisis in 2011 when tea party Republicans balked at raising the debt ceiling. Instead of cutting military spending, they called for severely limiting Medicare benefits. The crisis created the first-ever downgrade of U.S. debt by Standard and Poor's. In 2013, Congress again refused to raise the debt ceiling or fund the government. It led to a 16-day government shutdown and global fears of a U.S. debt default. Instead of focusing on job creation, it focused on austerity measures. That kept economic growth lackluster. The U.S. debt crisis has continued. Democrats and Republicans accuse each other of increasing the debt when they are out of power. But they both continue to spend when they are in control of Congress.